If you put your buffalo tofu wings on a salad, does that make it the healthiest meal of your life or what? As I could eat this meal non-stop (and have had it a half dozen times this month already! ), that sure would be a nice perk. Tofu, breaded and baked until crispy then doused in a buffalo sauce. 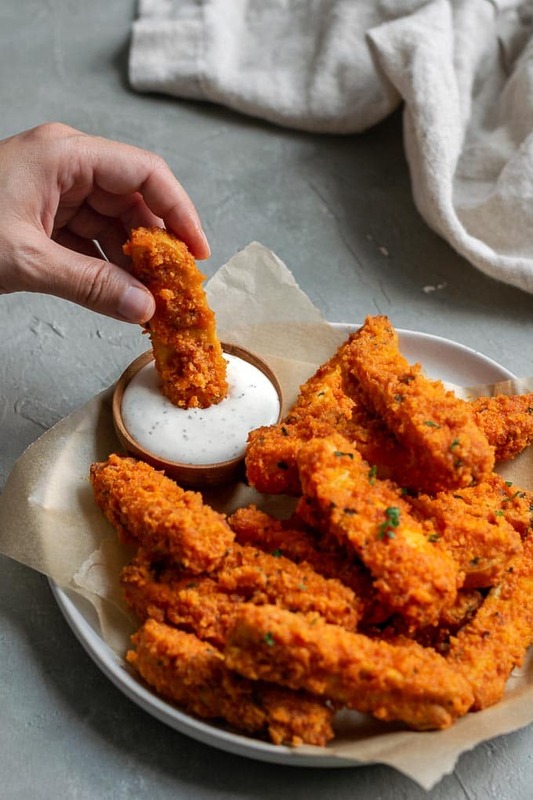 When dipped into some vegan ranch or bleu cheese dressing it makes the best finger food. Sliced on a bias and set atop a crunchy salad you have a colorful, easy, delicious, and nutritious meal! I first had buffalo tofu in college. It was one of the veg options at the dorm dining halls, and would rotate across the menus on campus. My best friend and I would always seek it out, regularly choosing to traipse across campus just to get our buffalo on! Snow, rain, nothing could hold us back from that salty, spicy tofu. To be honest, my college’s recipe for buffalo tofu was nothing to write home about. 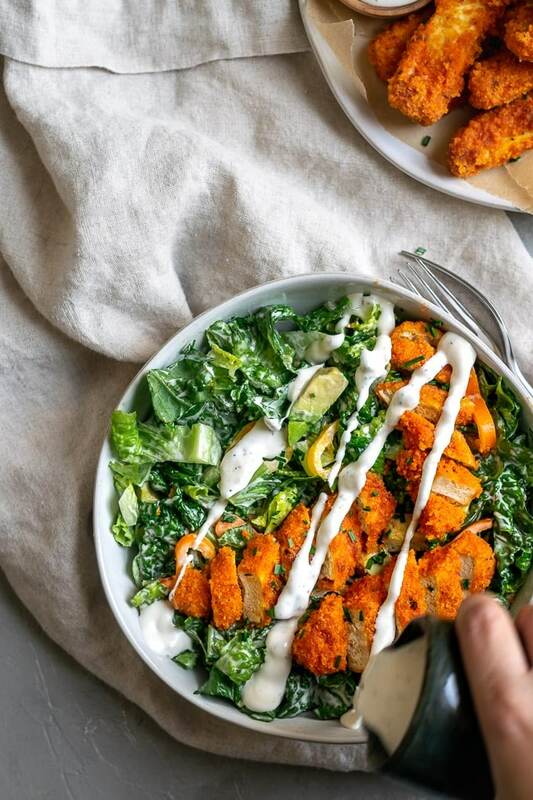 I mean, I’d still happily dig in or walk 20 minutes to eat it (but also, that’s not that far) but it wouldn’t hold a candle to this recipe for buffalo tofu! But, even so, this recipe gives me all the nostalgia feels. 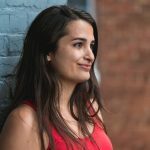 I threw together some buffalo tofu for a quick weeknight meal a few weeks ago when the fridge was particularly stark, and it came out so well I knew I would have to recreate it for you guys! So I made it again, but real talk, I wasn’t completely satisfied the photos I took. And on top of that, I had forgotten to add the croutons to the salad, so, oops! Croutons really take the salad to the next level! Plus you know how I feel about all things carbs (digest version: I love carbs). Fast forward a couple of weeks and I remake the buffalo wings once more to reshoot, and lo and behold I forgot the croutons in the photos again! Gah! But you can be assured that I added them to eat. So what’s the key to getting nice, crispy buffalo tofu wings? First step is choosing your tofu. You want a very firm tofu for your wings. One that has had most of water pressed out of it, so an extra firm or super firm tofu is ideal. If using an extra firm tofu, you’ll want to press some extra water out of the tofu for best texture. Cut your block of tofu into slices (I cut mine into 6 slices widthwise) and wrap in an absorbent lint-free towel or paper towels and place a weight, like a heavy pan, overtop. Let that sit for 20-30 minutes then slice into the ‘wings’ and move on to breading the tofu. I like to use a double breading technique for the optimal crispy tofu wings. First, dip the cut tofu into some starch, it’ll stick to the damp tofu. Next, dip into a little bit of plant milk which will create a nice sticky surface when absorbed into the starch. Then lastly, dip them into a prepared bread crumb mixture and place on an oiled pan. The bread crumb mixture is made of panko style breadcrumbs and a bit of paprika, salt, black pepper, fresh minced parsley, and a drizzle of olive oil. The oil adds a richness to the breading, which makes for extra tasty ‘wings’ when baked. 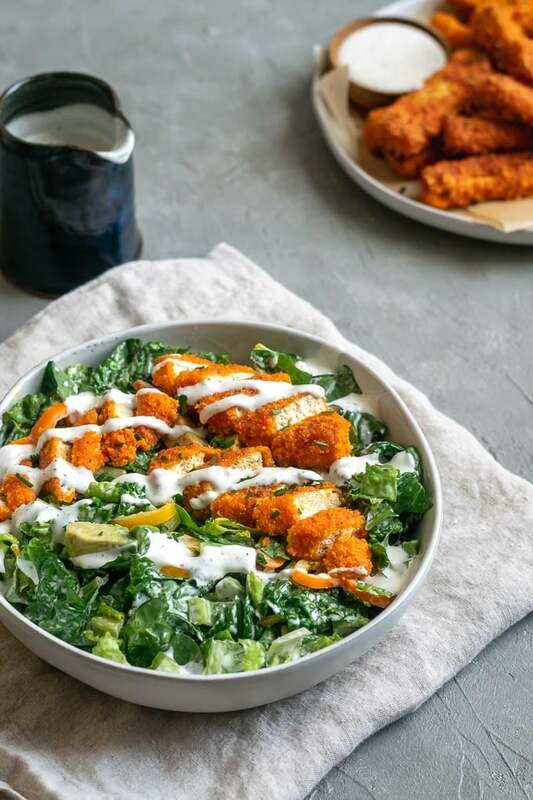 The breaded tofu wings are baked until nice and crispy, then tossed in a spicy buffalo sauce. 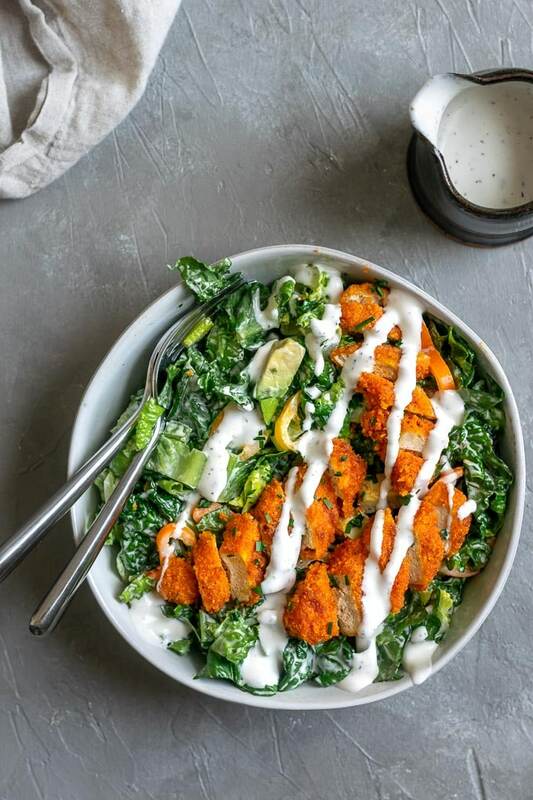 Buffalo sauce is made of hot sauce, melted vegan butter (you can always substitute oil–and I’d suggest refined coconut oil– but you’ll want to add more salt if you do), a bit of garlic, and a pinch of salt. The hot sauce you choose for buffalo sauce is very important. You want a red cayenne pepper-style hot sauce, as these tend to be not too spicy (by my standards). 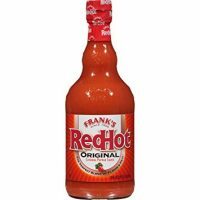 I use Franks RedHot, some people prefer Crystal Hot Sauce and others like Louisiana Hot Sauce. If you don’t have an opinion on which hot sauce to use then you better make this recipe three times with each of those hot sauce brands (or maybe a less mainstream one?) and come up with a super strong opinion stat! 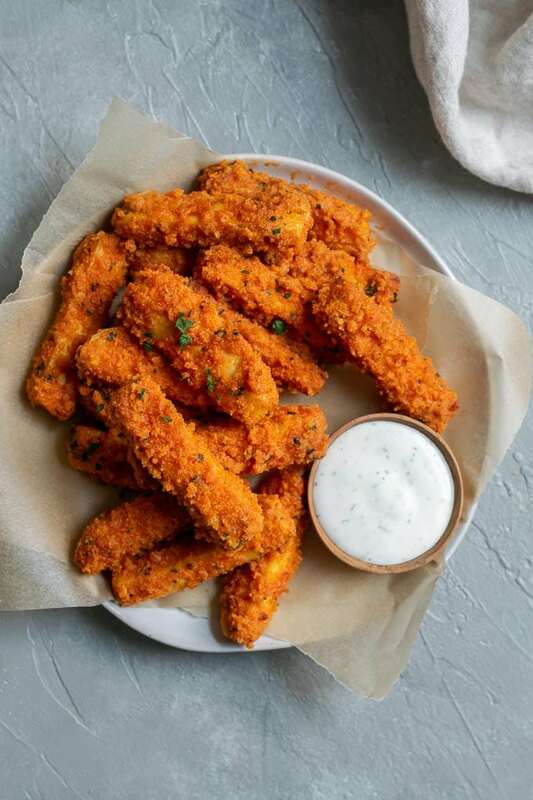 J/k, though it would be worth eating these crispy baked buffalo tofu wings that many times. The way you control the heat level when making buffalo sauce is by adding more or less [vegan] butter to the hot sauce. If you want a milder sauce, add more butter! If you want it spicier, add more hot sauce or less butter. Easy peasy. If you don’t bake the tofu wings long enough, they’ll end up a bit soggy when tossed with the buffalo sauce. So give them as long as needed to make an extra crispy breading before adding the hot sauce! Enjoy the buffalo tofu wings hot out of the oven with some creamy sauce for dipping. They’re perfect for a party appetizer, or for a munchies style dinner. 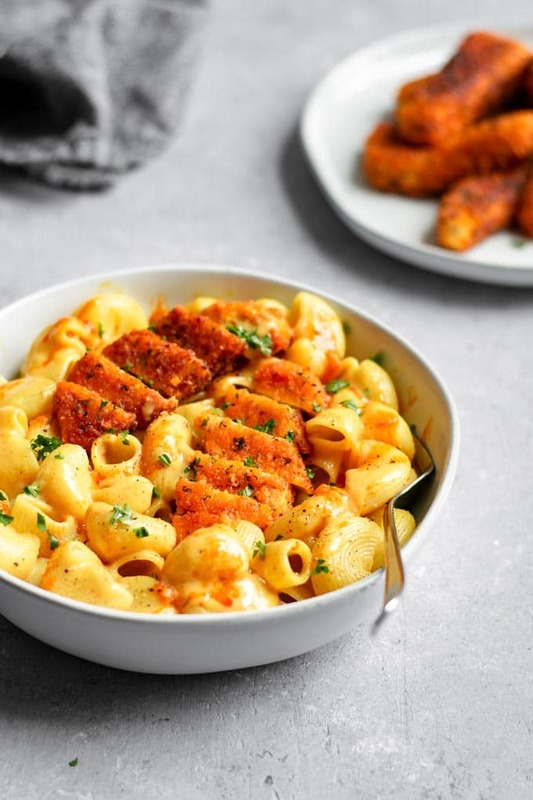 They also make for the most epic vegan mac and cheese! But I went a little crazy over this salad pairing. To make the salad I chopped up romaine hearts, thinly sliced sweet peppers, cubed some avocado, and tossed it all together with croutons (check the ingredients on these as most are not vegan) and some creamy vegan bleu cheese style dressing. And atop that I added some the crispy baked buffalo tofu wings. It is probably my most favorite salad ever! I don’t often choose to eat salad for dinner (especially not over mac and cheese), but boy oh boy I have a soft spot for this one! 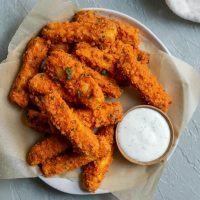 So I hope you guys enjoy these crispy baked buffalo tofu wings, and I’d love to know how you serve them up if you make them! Don’t forget to leave a comment and rate the recipe below, and tag your recreations @thecuriouschickpea and #thecuriouschickpea on Instagram! I love seeing your photos! For a store bought dressing, I like Follow Your Heart Ranch and Bleu Cheese Dressings. Or make your own ranch! My ranch recipe can be found in my recipe for buffalo soy curl pizza. For a gluten free tofu wing, use gluten free and vegan panko style bread crumbs. And for a gluten free salad, skip the croutons or make some of your own with gluten free bread! Cut your tofu into 18 'wings' or ~1/2" sticks. Cut the block of tofu into 6 slices width-wise if you haven't already for pressing, then slice each of those slabs into 3 slices lengthwise. Dip each tofu 'wing' into the starch, followed by the milk, then roll in the breadcrumbs on the plate. Place the wing onto the prepared baking sheet and repeat with the remaining 'wings.' Use one hand for the starch and bread crumbs and your other for the milk to keep breading from clumping on your fingers. Add more of the breadcrumb mixture to the plate as needed. While they're baking, make the buffalo sauce. Melt the vegan butter and stir in the hot sauce, granulated garlic, and salt. Like these buffalo tofu wings? Try them with this easy and ultra creamy vegan mac and cheese! Hi Jeanette, I’m so sorry that you are having issues with the formatting, I will look into getting that fixed. In the meantime, if you shoot me an email [email protected] I’m happy to send you a PDF of the recipe. I just finished this recipe. Amazingly good. I seriously had my doubts but. WOW! So good. Thank you! Wow! These are amazing. I love them. Thanks for the recipe! Amazing recipe! I made the 2x this week. Thanks for sharing and Happy New Year! These were AMAZING I’ve been looking for a recipe like this for years! They were perfect!! Girrrrrllll! This recipe is incredible! I’m not a picky eater but rarely does a dish make me want to dance on the table. I didn’t, but I wanted to. We had the wings on greens, topped sweet peppers, celery and cherry tomatoes. I thought I would never again get to eat buffalo style food but this has brought new hope. Now I have something to eat on “game day” besides guacamole and chips. My roomies (who aren’t vegan) loved it too and want me to make it again soon. Thank you so much! . This makes me so happy! I’m glad you and your roommates enjoyed the tofu wings so much! Hi Miah, you can skip the oil, or add a light spray on the baking sheet before baking. Made these buffalo tofu wings for the family last night – they were soooo crispy and delicious. Everyone loved them dipped in Follow Your Heart Bleu Cheese style dressing. Let’s just say there were no leftovers! Yum Yum, Eva! What should I do to reheat it? Hi Lilly, I like to reheat them in my toaster oven (or regular oven but that’s a lot of energy for a few pieces of tofu), 375 F until crispy and hot. A dry skillet over medium low heat works really nicely as well! Just made these! So so good!!! I was in search of a baked tofu french fry recipe when I found this! Looks so good – I’m definitely going to try it! 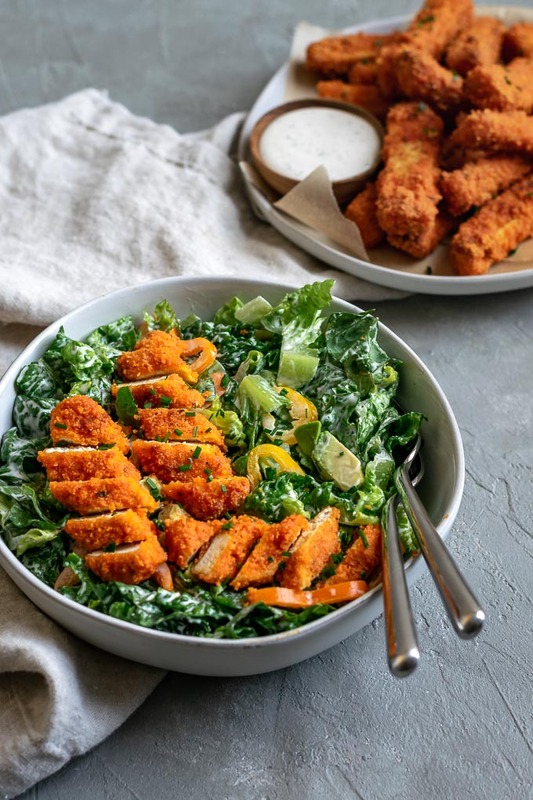 But how do you think this would be without the buffalo sauce, just as a good basic crunchy fry recipe? Can I use regular bread crumbs instead of the panko? Thanks. Hi Mary Ann, yes you can use regular breadcrumbs, but you’ll get a slightly different texture for the breading. I’ve done it and still enjoy it though! I was a bit disappointed with all the positive reviews. It was decent but I feel the actual tofu needed some kind of marinade for it to make me want to make it again. Omg these are soo damn good. !